If you donâ€™t mind dodging guys hosing old produce off the sidewalk, or navigating between delivery trucks ungoverned by stop signs or speed limits, this place is for you. If you like your food served up cheap and with a side of adventure, this place is especially for you. The place, overall, isnâ€™t well known, but youâ€™ve probably heard of it. Itâ€™s the Florida Avenue Market, a collection of warehouses bound by Florida Avenue, 6th Street, and New York Avenue NE. Itâ€™s raw and dirty and hit-or-miss friendly. Most of the places require a wholesale license to even set foot on the floor. But itâ€™s great, and inspires passion like you wouldnâ€™t believe. You may have heard of it because itâ€™s been in the news lately. To summarize, itâ€™s now caught in the tug-of-war between development and tradition thatâ€™s everywhere in DC. Come what may, Iâ€™d like to describe some of the lovely nuggets that you can find there. I say thereâ€™s no better time to celebrate whatâ€™s there than while itâ€™s still around. This is the most retail-oriented store along this route, so itâ€™s a good place to start. 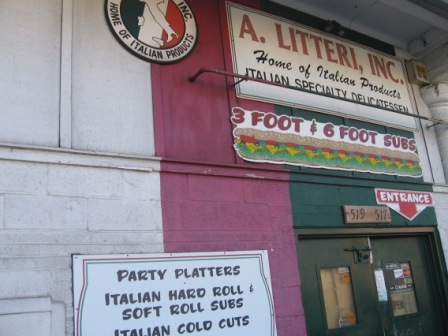 As a popular destination for Italian food enthusiasts and people who want an alternative to Subway, this has been a major hub for the petition to save the warehouse area. When I put my name on the narrow, undotted line, there were already pages of signatures crammed as many as possible to a sheet. Just looking around will either turn you off or make you understand why hundreds of people signed to save places like this. The first things youâ€™ll see are wine bottles stacked in their original cardboard cases, sliced open to display the goods. Many are adorned, incongruously, by the kind of signs that are de rigueur at overpriced wine stores describing a wine and its pairings. Then youâ€™ll notice the enormous restaurant-sized jars of banana peppers and â€œred pepper hullsâ€ (AKA red pepper or pimiento). Although these jars suggest clients stocking a restaurant or looking to cater an Italian wedding, overall this store is made for the individual Italian food lover. You can get an Italian sub made to order; dozens of kinds of fresh tortellini and ravioli, cheap fresh mozzarella on up to buffalo mozz and other fancy, cut-to-order cheeses; Italian bread; and reasonably-priced artichoke hearts and roasted red peppers. Litteriâ€™s is also known for its vast array of olive oils and balsamic vinegars, but Iâ€™ll let you Google it and see for yourself. This is on your left on Morse Street. Youâ€™ll first see some industrial-sized containers of bleach, but donâ€™t let that deter you. Inside is a wonderland of kitchen tools. Like all of the places along here, itâ€™s cheap! I got a small squirt bottle (great for storing homemade salad dressings or decorating plates with coulis) for 79 cents and a slightly larger one for a little more. A King Combination water stone for knife sharpening was $18.95, while Iâ€™ve seen the same thing elsewhere for $40. They also have various utensils, knives, plastic and ceramic sushi plates, pots and pans, bar supplies, and other cool stuff. The woman who rings me up (I suspect sheâ€™s one of the owners and operators) is always very sweet. She doesnâ€™t seem to resent that my bill is a tiny fraction of what the restaurateurs rack up. Sheâ€™ll even advise small-time customers like me on where to find things, or the best tools for their needs. 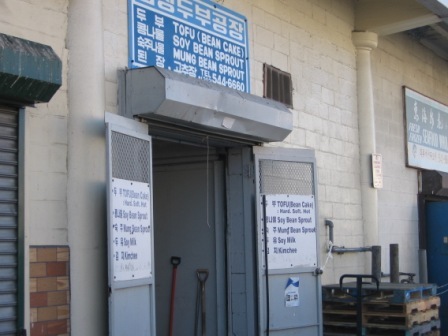 As you continue walking (you may be down to about 4th street by now), you will see a place advertising tofu and bean sprouts. Check them out if you ever need a lot of tofu (a 10-lb bucket of small blocks is $10 â€“ less than half the price per lb of most tofu) or bean sprouts (a 10-lb bag is $3). You can see the operation going on inside, and may have to avoid a stream of whey trickling past your feet. The tofu is so fresh that sometimes itâ€™s still warm â€“ hot off the tofu presses. Ok, I donâ€™t think this is their actual name, but thatâ€™s what their gate says. And it doesnâ€™t sound like the kind of place where a vegetarian would feel at home, but it is! This is the best of warehouse shopping â€“ cardboard boxes arranged on palettes on the floor with untold delicacies and food adventures inside! Get a big bag of dried shitake mushrooms ($3.25 for your average mushrooms, about $5 for thicker, meatier ones) or coconut milk (65 cents a can) or rice noodles (95 cents per package, which could take care of pad thai for a medium-sized dinner party). If youâ€™re feeling adventurous, go for the preserved duck eggs or various pickled veggies. They also have pickled ginger and wasabi sometimes. If you do eat fish, they have a big selection of fresh and frozen fish, as well as bottles of fish sauce. Get here early and bring your winter coat. This place is open from the wee hours of the morning to 3 p.m. and the pickings get slimmer the later it gets. 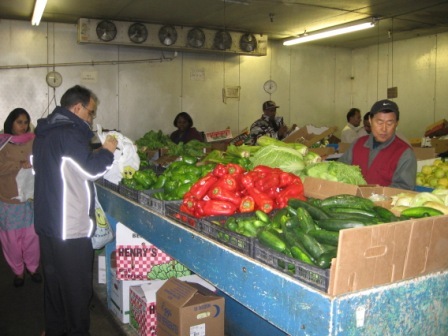 In their walk-in refrigerator thatâ€™s bigger than most DC apartments, you can find herbs, fruits, and vegetables for very cheap. They also have large containers of peeled garlic and cooking oil. While youâ€™re perusing the selections, you can sip a can of coconut milk or mango juice from the beverage selection that also resides in the box. I havenâ€™t bought anything at Sam Wangâ€™s in a while, so I canâ€™t quote any prices. I just know Iâ€™ve gotten scads of produce for a few dollars. I did scout it out to write this summary, but gave up on buying my few items because the line was long and full of shoppers who looked like they planned to feed an army. This place also has more exotic selections to expand your repertoire, like sour melon (used for Indian cooking) and banana flowers. So I recommend picking up one or two things youâ€™ve never cooked with when you go. Like some of the other places (ok, damn near all of them), this place is deceptive at first. It seems to specialize in 50-lb. bags of Japanese rice, which are stacked to impossible heights all around. However, here you can also find great deals on nori and miso. You can get a package of 50 sheets of nori for around $7. Those babies last me for months. Miso is also about $7, if they have it. You get a huge container that will last you for a while. Remember, misoâ€™s already fermented, so it wonâ€™t really go bad. By now, youâ€™re probably completely shopped out. I recommend heading for the car at this point. If youâ€™re on foot, youâ€™ll have to waddle your bags of delicious stuff to the New York Avenue/Florida Avenue/Gallaudet University metro a few blocks away. But with all the money you saved, you could easily justify a cab ride home. This reminds me that you’re in DC, where there is purportedly a Uyghur restauarant. Any word on the finding of Uyghur cuisine in Washington, DC? Hey, Danielle! Almost didn’t recognize you with the new last name! 🙂 And thanks, Cheryl and Grace, for your comments! I haven’t heard of any Uyghar restaurants around here, unfortunately. Anyone else? Truth be told, our Chinatown is tiny compared to the likes of NYC, and even that small area is replete with Irish pubs and tapas restaurants. But you should definitely cruise around the Chopstix Guide, which is a great resource for Asian dining in the DC area and even has a veggie section if you’re into that. Maybe you’ll have better luck than I did on this one. Rhea, Thanks for taking us through the tour…I’ve been there with you before, and recognized the places, but they shine with new potential thanks to your descriptive and evocative writing!